Leopard gecko (Eublepharis macularius) is the most popular gecko pet in the household today. This leopard gecko care sheet will provide you with detailed, step-by-step guide on how to better care for your leopard geckos. Proper husbandry is key to healthy, long living leopard geckos. Leopard geckos are crepuscular reptiles, they are the most active during twilight (around dusk/dawn). They wake up early in the morning to hunt for food, then they will burrow underground or hide in rock crevices to sleep throughout the day. Then they wake up again in the afternoon/evenings to hunt for food. In the wild, leopard geckos are known to navigate at night using natural moonlight. Their origins are around the arid regions of south-Afghanistan, Pakistan, Iran, and north-west India. Leopard geckos are insectivores, they must be fed on live insects such as crickets, mealworms, superworms, roaches, Phoenix worms, etc.. This leopard gecko care sheet will give you a quick overview on proper husbandry. Links will be provided so you can read further into details of specific topics of leopard gecko care. Please follow the checklist below to obtain the equipment required to properly house your leopard gecko. If you aren’t an Amazon Prime member, you can try it completely free for 30 days here. You’ll save on retail markup when buying gecko supplies from Amazon. If you are a student with a .edu email address, you can get 6-months FREE Amazon Prime trial plus 50% off Prime subscription! This means Prime is only $49 for you, $99 for everybody else. You could cancel the trial before it’s up and pay absolutely nothing, all the while enjoying the Prime membership benefits such as fast 1-2 days shipping, unlimited video streaming, unlimited Amazon Drive photo storage, and more. 1. You will need a tank with mesh top. The tank needs to be at the minimum 10 gallon size (ideal for a juvenile leopard gecko), but the most common size for a leopard gecko adult is 20 gallon long (30x12x12). You can have a larger tank, but shoot for at least 20 gallon for a single gecko. There are some really nice front opening Exo Terra tanks that we really like. If budget suits you, consider them as they’ll make cleaning, feeding, and handling the geckos so much easier. Not to mention they are very well constructed and beautiful to look at. These Exo Terra All Glass Terrariums measure to 20-30 gallons, so they are perfect for 1-2 leopard geckos or african fat-tails. You always want to go with the long type with more floor space, rather than tall tanks. Because leopard geckos are ground-dwelling reptiles, they do not have sticky pads to climb unlike crested geckos. 2. You will need an under-tank heating pad. Leopard geckos digest food through belly heat, this is why under tank heating pads are preferred over basking light. You want to cover at least 1/3 of your tank with the pad (no larger than 1/2), so get the measurement before purchasing them. Zoo Med ReptiTherm is a popular under tank heating pad brand, Amazon’s #1 Best Seller. We recommend them. We also recommend you purchase a digital thermostat to use with your under tank heating pad. A thermostat will regulate your pad’s temperature so it won’t get too hot for your gecko. Your ideal floor temperature should be between 88-93 degrees. Hydrofarm Jump Start MTPRTC Digital Thermostat is what we recommend. It has thousands of positive reviews to back up its reliability and reputation. 3. 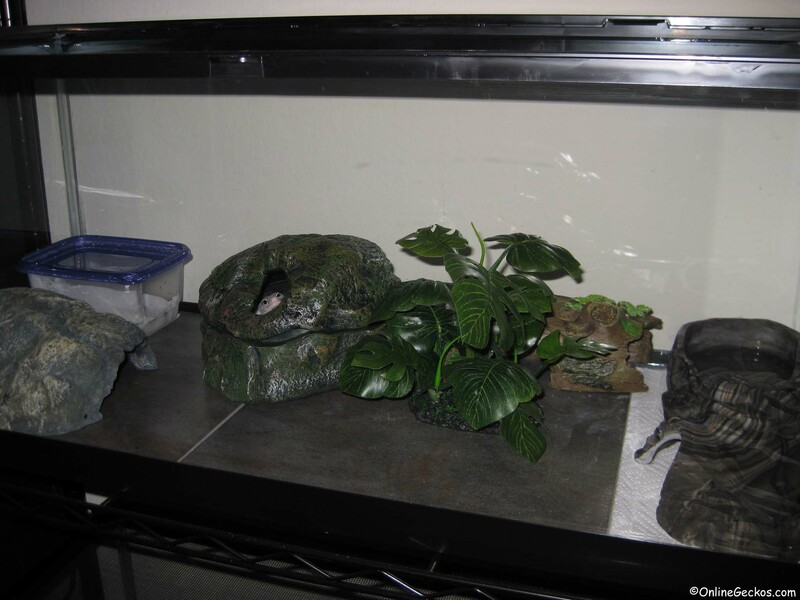 For tank’s substrate, we recommend slate/ceramic tiles or paper towels. You can get the tiles from your local hardware stores. If you have a standard 30x12x12 long tank, you can easily fit 12×12 ceramic tiles in them. They are the best and safest substrate for your leopard geckos. In the wild leopard geckos live in rock crevices & burrows, so the tiles will feel very natural to them. Avoid loose substrate such as sand or you risk impaction. Impaction can lead to death. For moist-hide we recommend Eco Earth coconut fiber. Coconut fiber is great to use as moist hide substrate, and it doubles well for female’s laybox substrate if your female needs to lay eggs. 4. You will need 3 hides, a warm hide, a moist hide, and a cool hide. These 3 hides will allow your leopard gecko to thermoregulate their body temperature while feeling safe in their living environment. The moist hide should be placed between your warm & cool side, somewhere in the middle, so it stays warm and humid for your gecko. A popular method is to place the moist-hide half on the warm spot, half on the cool spot. The Moist-hide is needed so your leopard gecko can shed properly. Hides should be tight fitting hides so your gecko will feel safe and secure. If you take a look a the picture of the tank above, you’ll see that there are the warm hides on the left, the moist hide in the middle, and the cool hide to the right. With ceramic tiles as substrate, and paper towels laying over the left-over spot. Inside the moist hide is eco earth coconut fiber for the female. This is pretty much all you need to have a proper tank setup for your leopard gecko. Leopard geckos are insectivores. You will want to feed your gecko a variety of insects such as crickets, dubia roaches, superworms, mealworms, waxworms, hornworms, etc.. We purchase our feeders from Rainbowmealworms, they have good variety and great prices. Get a 10% off Coupon on your next order at Rainbowmealworms here. When you click on the link to Rainbowmealworms, a window will popup on the lower left hand side of your screen. Simply sign up with an account and make a purchase, you’ll be able to utilize the 10% off coupon with your order. Another good place to buy feeders in bulk is on Amazon, since sellers are often competing against each other which could result in lower prices. We’ve found some good prices on bulk superworms, mealworms, dubia roaches, waxworms, and hornworms. We’ve added a new leopard gecko feeder insects nutritional values guide. Please have a look if you would like to learn more about popular feeder insects used for leopard gecko feeding. We have a table comparing the nutritional facts of various popular feeder insects. What you wan to do is to dust your insects at every feeding. For juvenile geckos, you want to feed them every day. So you would dust every day. Once your gecko matures to a year old, they will start to eat less, usually once every 3-4 days. You will still want to dust at every feeding, which amounts to 1-2x a week. You should always have fresh water in the tank, so make sure you get a nice water dish. Exo Terra water dish is nice as its nonporous surface prevents bacteria buildup and absorption. Be sure to also get yourself escape-proof feeding dishes such as OMEM Ceramics Made Worm Dish. Smooth surface and inwardly curved walls make them perfect dubia roaches & mealworms escape-proof feeding dishes. To read more about how to supplement, dust, and gut-load your feeders, please visit our comprehensive leopard gecko multivitamin supplement guide. The guide will explain to you leopard gecko’s vitamin needs, including the popular questions about gut loading, calcium, and D3. Leopard geckos have no special humidity requirement. However persistent high humidity can cause upper respiratory infection. We do not recommend using coconut fiber throughout the whole tank. By using a moist-hide/laybox, you isolate the high humidity spot so it won’t be humid all throughout the tank. Your leopard gecko will go inside the moist-hide to shed and rest. Leopard geckos do not have any special lighting requirement. Leopard geckos are crepuscular, they are the most active during fading light around dusk & dawn. You’ll notice in the early mornings, your geckos are out roaming around, looking for food. But then they will sleep through the day, until later in the afternoon when they wake up and start roaming around again. This is their normal daily cycle in captivity. We get a lot of hobbyists asking us if they should use the basking lights that come with their retail kits. We know retail kits often send you home with basking lights and perhaps a night light. 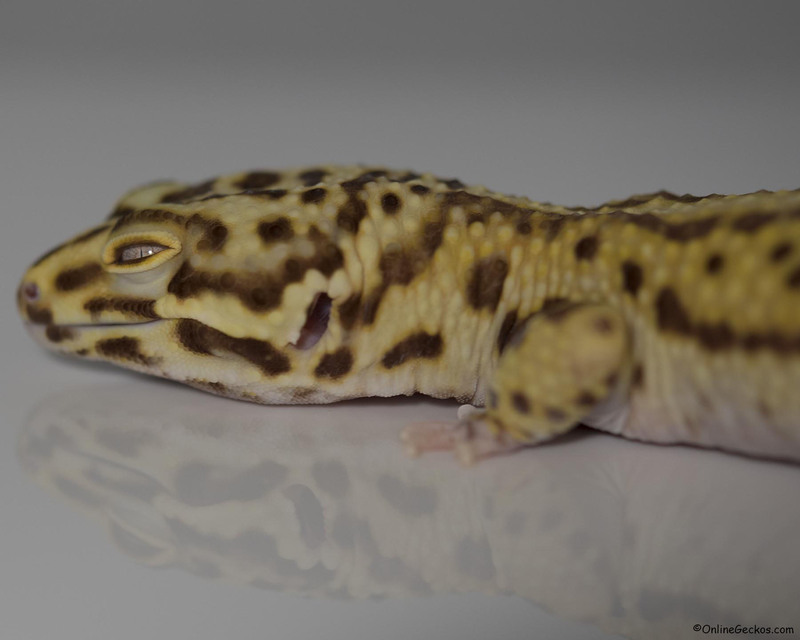 Leopard geckos really do not require basking lights since they sleep during the day. Unlike diurnal species such as iguanas and bearded dragons, they do not bask in the sun during the day. In the wild, they would burrow deep into the ground during the day and hide completely away from sunlight. The little light they would receive are usually during fading light later in the afternoon or early in the morning. When you provide basking lights, it can actually be harmful to them since the tanks are often too small for such basking lights to be applied safely. 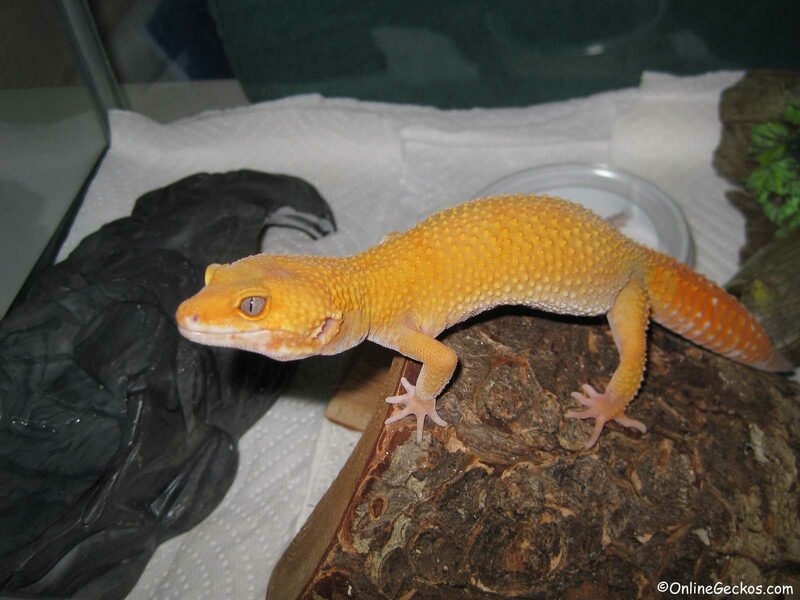 To safely utilize UVB for leopard geckos, you would need to use at least a 20-40+ gallon tanks. You would have to provide plenty of hides and foliage to allow your geckos to completely hide away from light. And you should set your light on a timer so it only comes on for a few hours a day. Limited exposure to UVB is very important for crepuscular species. If you provide UVB, you should supplement less as you risk vitamin D overdose. If your gecko is an albino of any sort, you should never use basking lights because albinos lack black pigments. They are more susceptible to harmful UV, and their eyes are very sensitive to any sort of bright light. Forcing UV on them would actually cause burns and blindness. Due to the complexity in providing UVB properly, we recommend to most hobbyists to not utilize a basking light.